This article reviews one of the most common business deductions, especially for self-employed business owners, the Home Office Deduction. So if you’re getting everything together for your tax return, and you have some business expenses you want to claim–Great! The Home Office Deduction is useful if you have a portion of your home that is used exclusively for your business. If you aren’t using the home office exclusively for business, then you can’t claim it as an expense. If that’s the case, then please consider using a Coworking space to help your business. If used correctly, it can help limit the amount of taxes owed thanks to your business when you’re filing your tax return. A portion of home repairs and expenses can be deducted as a partial business expense during the IRS tax season. The Simplified Home Office Deduction is far more convenient, and requires less paperwork to do properly. This can be helpful, but there are some cautions in using this home office deduction. If you use the standard home office deduction method and eventually sell your home at a profit, you will have have to pay a capital gains tax on the total amount of depreciation deductions you took while you were living there. Meaning you have to put even extra effort into tracking, and then return some of your savings when you sell the house. Limit on write-offs – the law puts a cap on how much you can deduct for the business use of the home. Basically, your home office deductions can’t exceed your home-based business income. In other words, home office expenses can’t create a tax loss to shelter other income. Limit on Simplified Home Office Deduction: The simplified home office deduction does help make things easier, and you don’t have to pay capital gains tax in the future; however, you’re limited to 300 square feet of exclusively used home office space, and you’re limited to $5 a square foot. This means your maximum allowable deduction for your home office is $125 a month for a 300 square foot office. People often have a home office of around 120 square feet, so the monthly amount deducted is only $50. You may also have to show how you exclusively use the home office for business in case of an audit. 100% of your Zoseco membership is deductible as a ordinary business expense. No need to determine square footage, track furniture or coffee use, or anything else. This also works out to be more of a deduction than the maximum of the simplified option for home office deduction through the IRS. 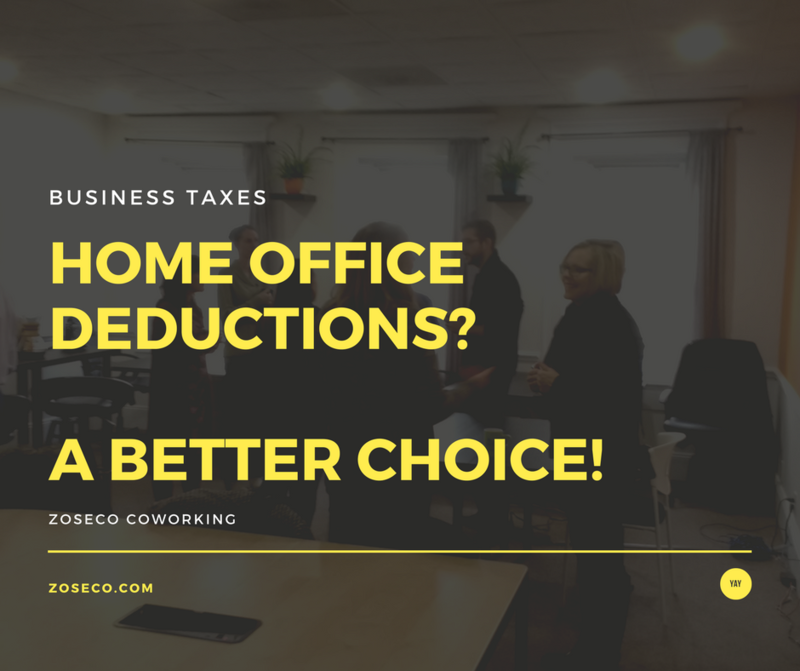 Working from Zoseco not only gives you the fastest internet in Valparaiso, some of the best furniture available, and coworkers who help you grow, but it’s also a place where you can actually get things done, and deduct the entire membership fee when it comes to your tax return! Coffee shops also have their own unique deductions, but usually it’s limited to 50% of your bill if you also buy coffee for a potential/current client. This means only half your bill is going to be deductible, and then you also have to keep track of all your receipts. Inviting a client to Zoseco not only leaves them with a far more professional image, but you also save on latte costs at the same time. Zoseco Coworking exists to be the most supportive community of entrepreneurs in and around Valparaiso, Indiana. We started Zoseco to help our peers out, and we now have an awesome group of people working from our location who want to see one another succeed. We’ve also become quite amazing at making coffee over the years, so you definitely should come check us out. To schedule a tour, and to receive 10% off of your first month’s membership. Fill out the below form and use the promo code ‘taxes’ in the information about yourself. The above article is intended to provide generalized financial information designed to educate a broad segment of the public; it does not give personalized tax, investment, legal, or other business and professional advice. Before taking any action, you should always seek the assistance of a professional who knows your particular situation for advice on taxes, your investments, the law, or any other business and professional matters that affect you and/or your business. Basically, we’re professional, but not *that* professional. Get 10% off your first month by putting in "taxes" at the link below!